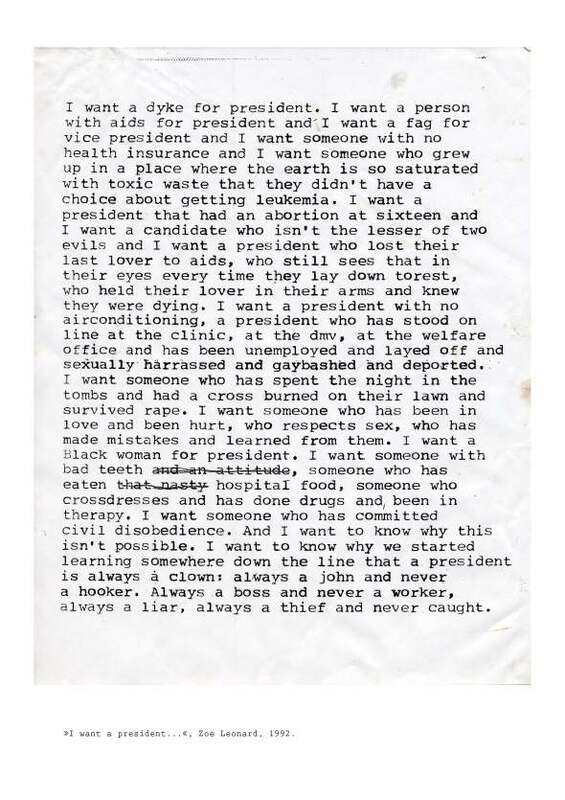 I want a president… (a collective reading - DC) is a public art project, encouraging a radical reimaging of political possibilities within and beyond the electoral system. It is a chance to think, debate, share and shout our desires for things that seem impossible from where we stand now. Inspired by a 1992 text piece by artist Zoe Leonard, the project will adapt her list of demands to reflect the urgencies of today through in-person workshops and online discussions. In advance of Election Day, we will come together in front of the White House to read both the original and the adaptation, connecting the concerns of the past with the needs of the present, and disparate, yet collectively-voiced desires for an alternate future. The first U.S. iteration of this collective reading project will take place in Washington, D.C. on Sunday October 16 at 5:30pm, as the closing event of the Creative Time Summit DC: Occupy the Future. In the months leading up to the reading, we will be organizing writing workshops and using social media platforms to initiate wide-ranging conversations about the original text by Zoe Leonard, considering what has changed and what has stayed the same regarding to horizons of "representational politics" since she wrote it in 1992, and what experiences, identities and social realities we still don't see represented in 2016. These workshops and discussions will inform a contextually-specific adaptation of I want a president... that will be read along with the original in front of the The White House before the election. The collective reading I want a president… was first initiated by artists Malin Arnell, Kajsa Dahlberg, Johanna Gustavsson and Fia-Stina Sandlund in response to the 2010 general election in Sweden, in which a fascist, racist and homophobic party entered the parliment. In collaboration with artist Zoe Leonard, they made an adaptation of her text I want a president… (1992) in Swedish, and on the day before the election gathered with other concerned citizens in a square in Stockholm to read the English and Swedish texts together, over and over again, for one hour. This first collective reading inspired a series of invitations from other countries going towards election, from Estonia to Puerto Rico to England. The time seems apt for the text to now return to the United States, as we face a presidential election rife with fascist, racist, sexist, homophobic and xenophobic rhetoric, and premised on both major parties’ capitulation to neoliberalism as the new world order.